Although biological grafts have been utilized as a vascular conduit in leg bypass for many years, reports of a bovine carotid artery graft (BCAG) in lower extremity revascularization have been scarce. This study analyzed the outcome of lower leg bypass using BCAG. A retrospective review of a prospectively collected database of all patients undergoing lower extremity bypass using BCAG from 2002 to 2017 was performed. Clinical outcomes including graft patency and limb salvage were evaluated. A total of 124 BCAG (Artegraft, North Brunswick, NJ) were implanted in 120 patients for lower extremity revascularization. Surgical indications included disabling claudication in 12%, rest pain in 36%, tissue loss in 48%, and infected prosthetic graft replacement in 3%. Autologous saphenous vein was either inadequate or absent in 72% of patients. BCAG was used in 46 patients (37%) who had a prior failed ipsilateral leg bypass. 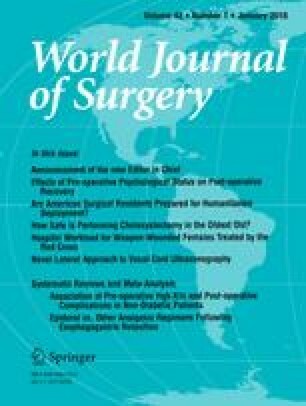 Distal anastomosis was performed in the above-knee popliteal artery, below-knee popliteal artery, and tibial artery in 30 cases (25%), 32 cases (26%), and 48 cases (39%), respectively. Distal anastomotic patch was created in all tibial artery to allow BCAG-tibial reconstruction. The yearly primary patency rates in 5 years were 86.5, 76.4, 72.2, 68.3, and 67.5%, respectively. The corresponding yearly secondary patency rates were 88.5, 84.7, 82.4, 78.5, and 75.6%, respectively. The limb salvage rate at one year was 83.6% and at five years was 86.2% for patients with critical limb ischemia. Multivariate analysis showed poor runoff score (P = 0.03, 95% CI, 1.3–5.3; OR, 1.6) was independently associated with graft occlusion. BCAG is an excellent vascular conduit and provides good long-term results in lower extremity bypass.